Before the NBA Finals tipped off last Thursday, I and others thought the Cleveland Cavaliers might give the Golden State Warriors a better fight this year than last. Unfortunately for Cleveland — as usual — that notion is quickly vanishing. Fresh off an easy 15-point victory in Game 1, the Warriors crushed the Cavs by 33 in Game 2 on Sunday night, burying the Cavs in the most demoralizing 0-2 hole in championship history. Before this year, no team had ever beaten an opponent by 48 combined points in the first two games of the Finals. In 15 tries since the NBA adopted its modern playoff structure in 1984, only one team has gotten out of an 0-2 Finals hole: the 2006 Miami Heat. That team clawed its way back when Dwyane Wade put on maybe the greatest individual performance in Finals history, the kind of thing LeBron James is also capable of doing. But those Heat hadn’t played anywhere near as poorly as the Cavs have through two Finals games. It gets worse: If we expand our view to include all best-of-seven series since 1984, we find that 6 percent of teams with an 0-2 deficit have gone on to win the series, none of which were dominated as thoroughly as the Cavs. Never underestimate the heart of a champion, indeed. Cleveland needn’t go back so far in the history books for the other team to bounce back from a remotely comparable hole. This year’s Portland Trail Blazers were beaten by 41 combined by the Los Angeles Clippers in games 1 and 2 of their first-round series before storming back to win four straight. But it’s worth mentioning that the Clippers lost point god Chris Paul to a season-ending injury late in Game 4, significantly lowering the difficulty of a Portland comeback. By contrast, the Cavs would have to perform a revival the hard way — unless there’s another Steph Curry injury. Listen to the latest episode of our sports podcast Hot Takedown. The smart money says it probably isn’t happening. 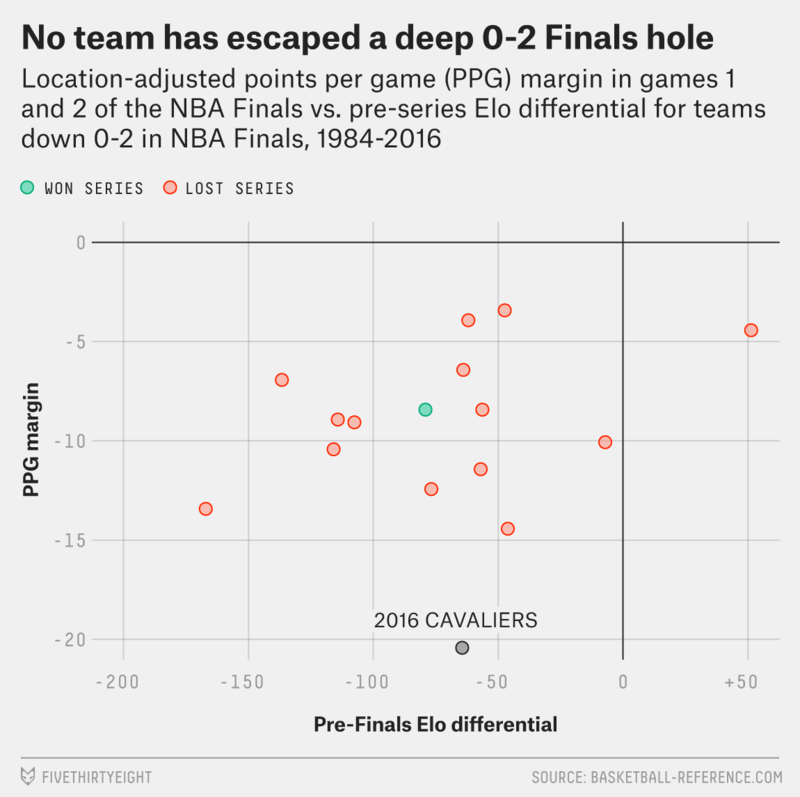 Elo gives Cleveland a mere 11 percent chance of winning now, and it doesn’t even know that Kevin Love’s Game 3 status is up in the air after suffering a concussion in Game 2. 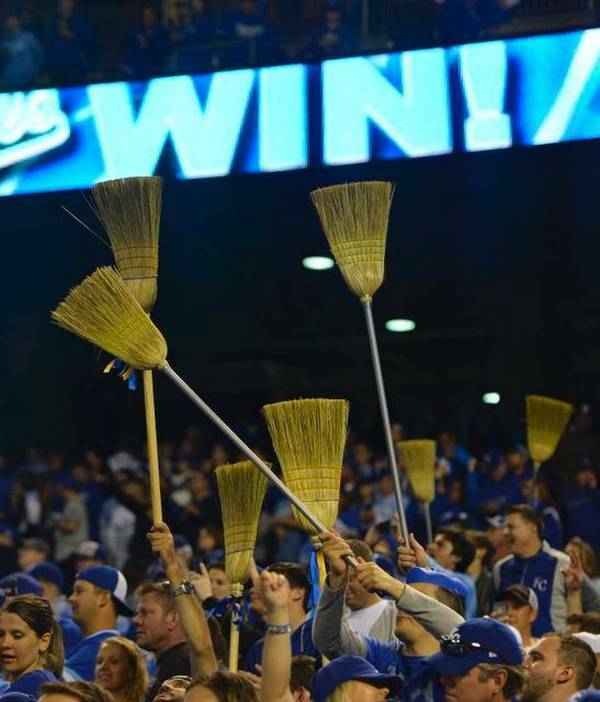 But talk of a sweep might be premature. 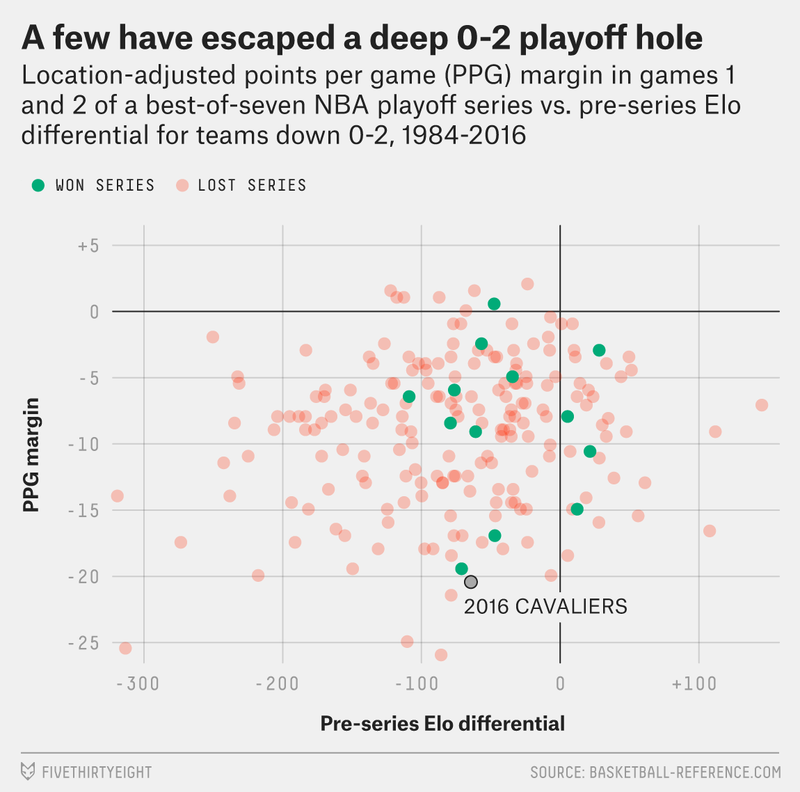 The same historical data that underscored the grim state of Cleveland’s title chances also shows that there’s little to no relationship between an 0-2 team’s margin of defeat in games 1-2 and the eventual length of the series. Although no team that was dominated as utterly as the Cavs has gone on to win a series from an 0-2 deficit, just as many forced a sixth game as were swept. In fact, of the 30 teams in our 0-2 sample to be beaten by an average location-adjusted margin of at least 15 points in games 1-2, only a third were swept; 30 percent lost in five games, 23 percent lost in six, 7 percent bowed out in seven — and 7 percent went on to win the series. 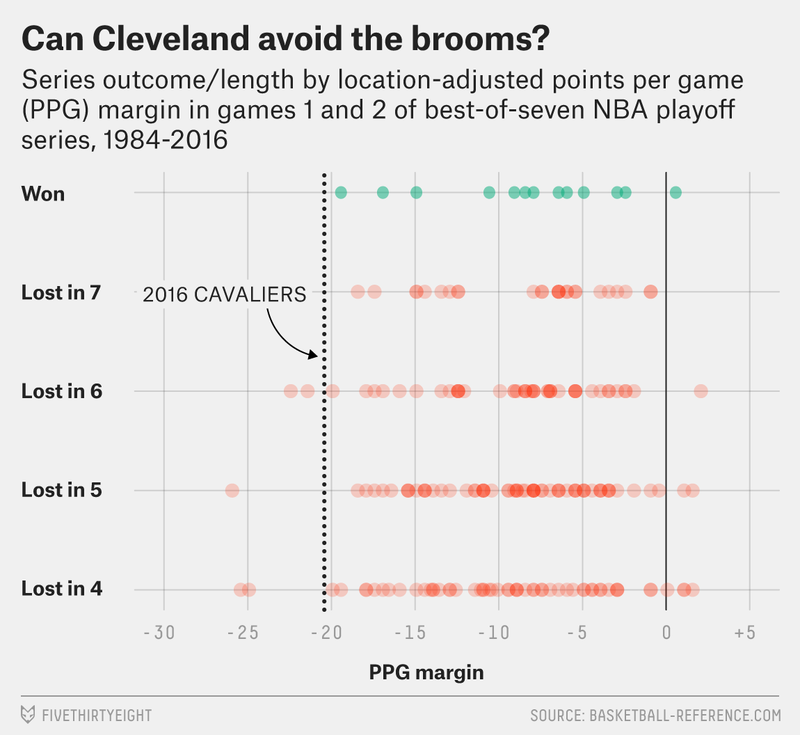 And if they’re looking for inspiration to avoid the brooms, the Cavs should look at themselves, but in reverse. Early in the Eastern Conference finals, Cleveland built a 2-0 lead, whipping the Toronto Raptors by an adjusted average of 21.4 points per contest. That was a start so dominant that it had us speculating on the Cavs’ place in history, and it made the idea of the Raptors winning even a single game feel remote. But the Raptors promptly won two straight to tie the series (before eventually being closed out in six games). Faint consolation for Cleveland, but in dire times, it may have to serve.